Minterne Magna is a village in the Cerne Valley, West Dorset between Dorchester and Sherborne. The village is close to the source of the River Cerne among the chalk hills of the Dorset Downs. It is probable best known for its grand Manor House in which many famous families have dwelled including Churchill, Napier and Digby. The house was rebuilt on the site of a Victorian house between 1903 and 1906 and is a mixture of architectural styles. The gardens of the house consist of a chain of small lakes, waterfalls and streams, and over one and a half miles of walks. They also contain an important collection of Himalayan rhododendrons and azaleas which are combined with spring bulbs, cherries, maples and many fine mature and rare trees. The house attracts many visitors every year who come to marvel at the impressive and expansive gardens which are noted for their autumn colouring. Cerne Abbas is a quaint historic village nestling in the valley of the River Cerne in the Dorset Downs, West Dorset. The village grew around the great Benedictine abbey, Cerne Abbey, which was founded in AD 987 but the abbey was destroyed in the Dissolution of the Monasteries in the 16th century. Remains of the abbey can still be seen today. After the dissolution the village thrived as a small market town largely due to the excellent quality of its underground water, which is filtered by the surrounding chalk hills. The water was used to make famous quality beer which was sold in London and even exported to the Americas. Cerne Abbas once had 14 public houses but only three remain today. The water was also used to power other industries including milling, tanning, silk weaving and glove and hat making. In the 19th century the coming of the railways bypassed Cerne Abbas and the village went into decline loosing half its population and thus many of the houses fell into disrepair. Today Cerne Abbas is a bustling community surviving from its tourist industry, attracting many tourists from all over the world especially to view the huge ‘Rude Giant’. Cerne Abbas hosts an annual four day classical music festival, an open garden event every year in June, an annual village fete, horticultural shows and the Wessex Morris Men often perform on Bank Holidays. 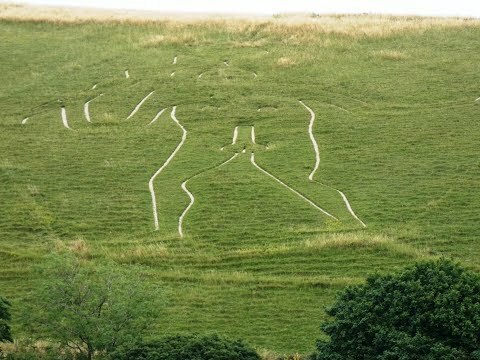 The Cerne Abbas Giant also known as the Rude Man is the largest hill figure in Britain and one of only two human representations. The 180 feet tall ancient figure is carved into the chalk hillside above the village of Cerne Abbas and the club he carries is 120 feet long. The origins of the Giant, now owned by the National Trust, are a mix of fact and speculation. There have been various theories as to who the man represents. Some believe that he represents the Roman god Hercules and is over 1500 years old or that he is a Pagan fertility symbol or carved by the Vikings representing one of their gods. With the church behind us and the green and car park on our right we head forward to the trees then turn right then left following the footpath signs. We bear left and head forward along the track uphill to the tree line. We go into the trees and turn left following the blue arrow along a wooded track. We keep following the track as it bears right downhill to the road. We now turn left and as the road bears left we turn right uphill across the field to the trees. We turn left round the back of the trees to go through a gate. We cross straight over the tarmac track and head forward bearing slightly right to a clump of trees. We walk straight through the middle of the trees. At the tarmac road we keep heading forward along the road. At the t-junction with the main road we head forwards along the road to the Cerne Abbas Giant view point on the left. After viewing the giant we take the minor road on the left into Cerne Abbas village. At the t-junction we turn left through the village and turn left just in front of the Royal Oak. We head forward past the church on our right to the top of the road. We turn left at the footpath sign ‘To Mill Lane’ then cross over a little bridge and turn right. We follow the stream on our right until we come to another bridge. We turn right over the bridge and walk through the trees for a short way then turn left then right following the arrows. We soon go through a gate then up the steps and follow the path. When the path splits at the end of the fence on our right we turn right steeply uphill. At the end of the fence line at the top we turn left and keep ahead on the path passing between two trees with a fence on our left. We come to a gate and go straight through sign posted Giant walk. We head forward through the field to go through the next gate then turn left at the sign post through a third gate. We head forward slightly downhill with the trees on our right to go through another gate the turn right with a fence on our right. We keep heading forwards through another gate and through the trees until we come to a road. We do not go through the gate but turn left here and head forwards to the right of the trees ahead and keep forwards until we arrive at a track. We turn left along the track, ignoring a blue arrow on our right, until we come to a sign post on our left. We turn left here and bear slightly right making our way downhill to the church and car park at Minterne Magna. This is an easy to moderate walk on grass and gravel footpaths and tracks and some minor tarmac road. There are some inclines and declines, one incline up to Giant Hill being very steep. Approx 6 miles allow 2½ – 3 hours using OS Explorer Map 117, Cerne Abbas and Bere Regis. This walk is done anti-clockwise. Start point: Minterne Magna in the car park opposite the church. Minterne Magna and Cerne Abbas, Dorset. Travelling south on the A37, Bristol to Dorchester road, pass through Yeovil then take the minor road on the left opposite Holywell. Follow this road to the A352 and turn right to Minterne Magna. The car park is opposite the church. Parking: Free car park in Minterne Magna opposite the church and also at the Giant viewing point. There are public toilets in the village of Cerne Abbas. For refreshments in Cerne Abbas there is Abbots Tearoom and three pubs, The Giant Inn, Royal Oak and the New Inn. There is also a post office and several other shops.